Can you get more out of your sales team? So, you want to increase revenue? Do you hire more salespeople or do you try to increase the existing team's productivity? Can you meet the goals of the organization by increasing the teams productivity? When you are looking to grow sales, knowing where the growth is going to come from is critical. When/if you need to hire more salespeople? Are you optimizing your sales resources? Are you leaving money on the table? How much?? The key is to determine where your sales team is. Is there room to grow or is the team maxed out? 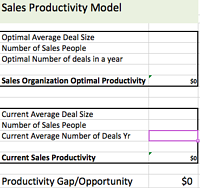 Find out if you can get more out of your sales team with this simple model.